Do You Have Change For 365? I have been keeping it since the beginning of October and at first I really didn’t believe that the thing I am about to share could even be real, so there was a lot of “Seriously?! Are you sure? Really? !” going on in my mind. You see, I am a bit of an activist. Nothing too radical, but it’s true, I am. It’s small actions that lead me because I believe small acts of kindness or small acts of charity or small acts of love can really add up over time and change people’s lives for the better. This is a philosophy I have imparted on my children (Daddy-O, too!) and when I see the reflections of my philosophies in Thing 1 and Thing 2 I just want to burst with pride. It’s an amazing feeling when you see your child make connections that show they really get what you have been modelling (read: preaching!). I am sure you know what I mean. Well, since Thing 1 is in Junior High, I have been extolling the virtues of Free The Children, Me to We and the We Act charities and we talk a lot about the Kielburgers and the extremely amazing things they have accomplished in their very young lives. Amazing people! I have been encouraging him to join his school’s We Act Committee since last year because what better way is there to put theory into practice than, well, by putting theory into practice? Have you ever seen the work that goes into organizing a bunch of teenagers to do anything? It’s not easy, is it? Well, the amazing thing about the kids that choose to take part in the We Act Committees in their schools is that they are the ones organizing everything. They are self motivating. They know they are doing good things. They know they can be the change they want to see in the world and furthermore they are being that change. So, I am very proud to say that Thing 1 *is* a part of We Act – and he’s very proud to say it, too. (That’s one win for the Mom, in case you are keeping track!) Yay! Of course, there are those who might think these kids are working only for We Day and all the amazing celebrities they might get to see, should they get to go (there are no guarantees! ), but the work the kids do is happening all year long. That’s right. 365 days of the year, teens in Canada (USA & UK, too!) are taking action to make this world a better, safer, more educated place. 365 days. That seems rather ambitious, doesn’t it? I mean, you can imagine how difficult such an undertaking might be. It could be overwhelming to try and keep track of a year’s worth of actions. TELUS (a proud sponsor of We Day) created We365, a free mobile app that enables youth to use their phones for good and propel social change through the power of technology, every day of the year. I downloaded the app when it was first released and played around with it. I may not be the target market, but I know a good app when I use it. The new and improved We365 app will help youth do even more to help their communities. Using the app, tweens (like Thing 1 and Thing 2) and teens can rally friends around causes they support, share their accomplishments, and earn badges and points. Parents of students who must complete “mandatory” volunteer hours (Ontario students, for example) will also be happy to hear that the app tracks volunteer hours, which can be shared electronically and remove the need to keep track of all that oh-so-easy-to-lose-track-of paperwork. 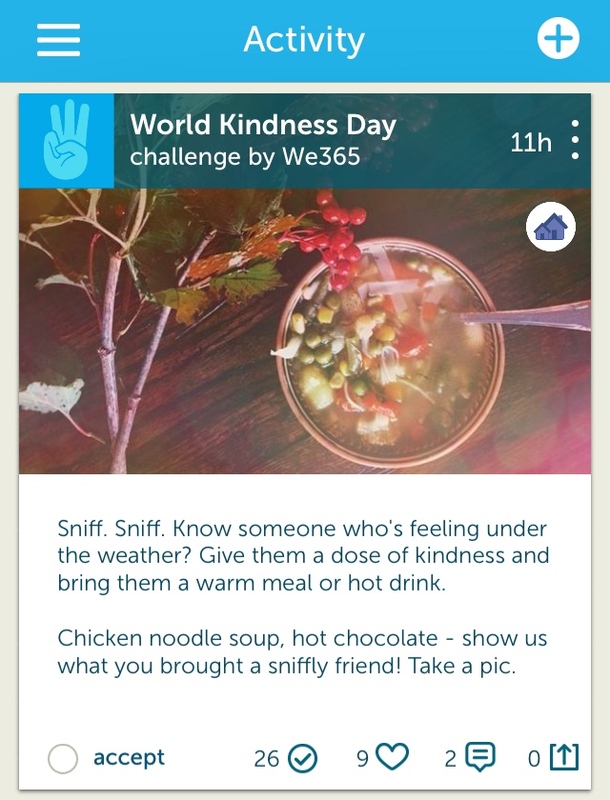 Here’s a glimpse of a challenge you might see when you use the We365 app. World Kindness Day? Oh, you get me We365 app. You really get me. Wait. 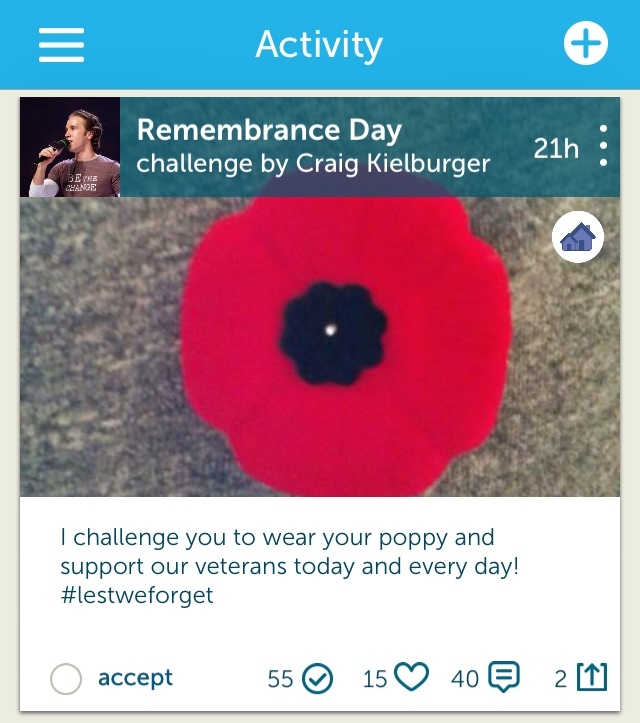 You mean Craig Kielburger himself uses this app? Yes. Yes he does. Come on! That’s cool. 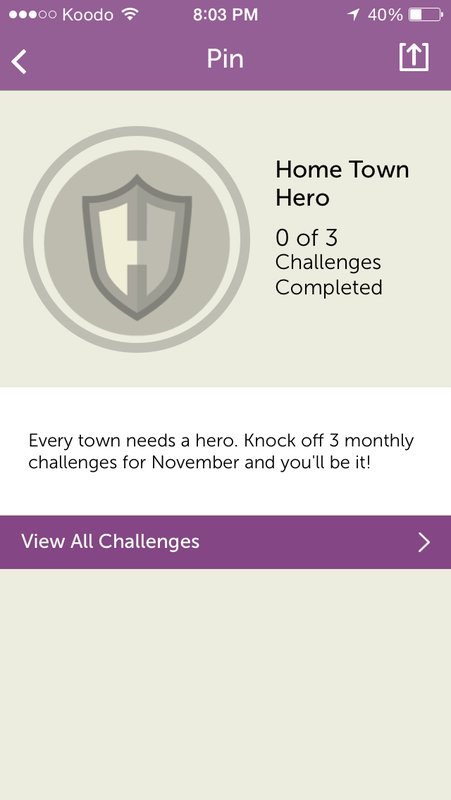 How about some badges to reward you for completing challenges? Fun, right? It can be very motivating to get this simple feedback and motivated people do wonderful things! Obviously, I am a fan of this app. Can you tell? I love the idea of tweens and teens cutting their social media teeth, if you will, in such a positive environment. I am encouraging Thing 1 to use the We365 app as a way of introducing him to the brighter side of social media. He is well aware of my perspective on using one’s powers for good. He knows how much of my time is spent online using social media. He knows that for the most part I really do practice what I preach. See the good, be the good! We often hear about creating a positive electronic footprint. What a great place to start! Now, about my little** secret. I am going to tell you, but you have to promise not to tell Thing 1, because he hasn’t a clue. I have been invited, by TELUS, to attend We Day Atlantic, on November 28 at Scotiabank Centre (along with a few of my blogosphere peers) to take in all the awesomeness. I believe so much in this initiative and kind of activism. Oh, and I’m still kind of freaking out. *That Ernest Hemingway quote is one of my all time favourites. This is kismet! So excited! Like, *happy jumpy claps* excited! **It’s HYOOGE right?!? So happy! !